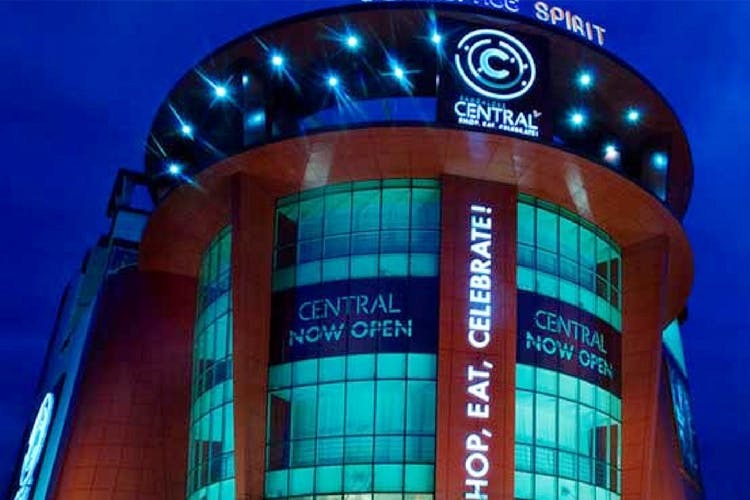 Spread across four floors of the mall is Central from the Pantaloons Group. This one departmental store is a host to more than 100 top-notch brands. If you’re looking to buy women’s casual or formal wear, shoes, handbags, jeans, ethnic wear, sarees, sportswear, men’s wear, kid’s wear, travel gear, cosmetics, lingerie, or anything else, you are spoilt for options here, and have everything available to you under one roof across many budgets. You don’t have to tire yourself driving around and shop-hopping anymore. You’re bound to be hungry after all that shopping. If you want burgers but your friend wants butter chicken, you can both have what you want. You could either opt for fast food choices such as KFC, McDonald’s, Pizza Hut, Cafe Coffee Day, or rest yourself and have a fine dining meal at Toss Food Lounge or thalis at Panchavati Gaurav. You could also pick up some supplies for the night from Madhuloka, the liquor boutique at the mall. There are plenty options around the mall too. Right across is Thalassery and across the road is Mast Kalandar, Chef Bakers and Bhagini Bar & Restaurant. If you want to catch the latest releases in style, head over to the PVR cinemas at the mall. It could either be your reason for visiting the mall or a spontaneous decision while shopping, but who doesn’t love watching a movie at the theatres? Grab a bucket full of warm buttery popcorn and watch a horror movie, a thriller, a romantic comedy or a drama of any language. If you’re going with your friends or taking along your kids, there’s a plenty to do here to entertain yourself. You could get on a game of bowling at the Strykes Bowling Alley, get your gaming geek out at P-Zone Gaming arena or experience multi-dimensional virtual reality at 7D Entertainment, all at this mall. Bowling, gaming and virtual reality sure does sound like a fun way to while away a few hours. Apart from retail therapy, there is another kind of shopping you can do. For all you book worms who could spend days at bookstores, glancing through the covers of every book, reading the synopsis on the back cover and maybe taking home a few interesting ones, there is a Crossword outlet for y’all. If you’re looking for new additions to your library, it’s right here!